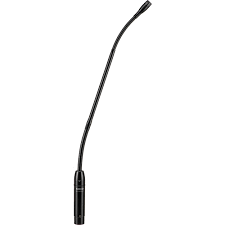 The QLX-D Shure MX412/S Supercardiod Gooseneck Microphone offers interchangeable cartridges and enhanced length and flexibility for reliably clear sound reproduction. It features high sensitivity and maximum resistance to electromagnetic hum and RF interference, even over long cables. For more information on microphone hire for events contact us today.